Though the x-rays were inconclusive, the orthopedic doctor we saw today is fairly certain that there is indeed a fracture in Cooper’s lower leg and he is now in a bright blue cast from his toes to his hip. When we woke up, he was actually in pretty good spirits. Kenny and Casey had gone out to run errands, so we had a nice quiet house. 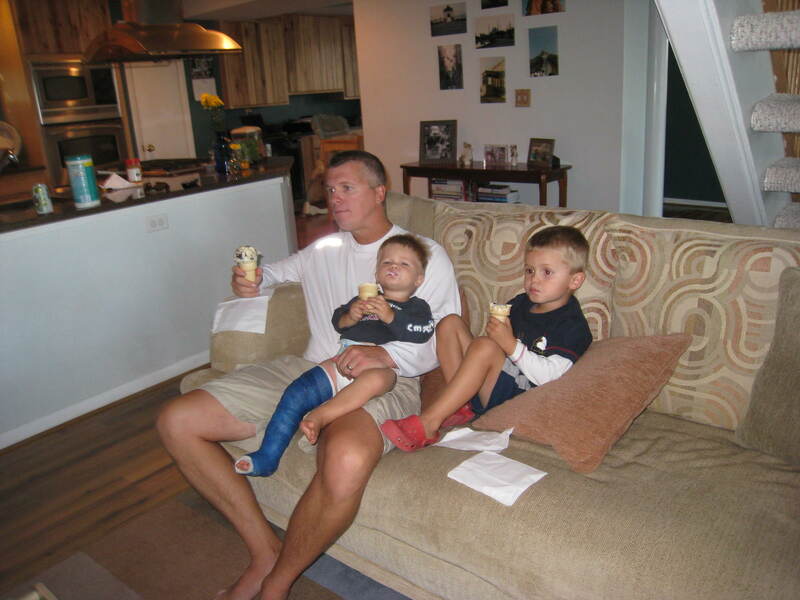 We sat in the floor and played, though every few minutes he would try to stand and would hit his cast, saying, “Off! Off!” By bedtime, he was getting around pretty well – he has figured out a sort of crab crawl to get where he wants to go, then can stand himself up, as long as he has something to hold onto. Or, if the going is slow, he looks up at me with those perfect blue eyes and says sweetly, “Hold-ye.” Melt. Casey and I have hit the wall of fatigue, after our sleepless night. Cooper didn’t sleep longer than 20 minutes at a stretch from 11 until 4:30am. At that point, Casey took off the splint they’d wrapped him in at Nighttime Pediatrics, and he finally fell into an exhausted sleep for about 4 hours. That thing must have been cutting off his circulation. Fortunately, the cast the doctor put on this morning seems to be actually making him feel better. We have to leave the hard cast on for two weeks, then back to cut off the cast and re-examine his leg. If he seems to have no more pain, they will let us go free. If the pain is still there, and he still can’t walk, they will put on a new cast, which will most likely remain for another 3 weeks. Looks like I’m going to be building some serious tone into my arm muscles over the next few weeks! I’m so sorry to hear about that! 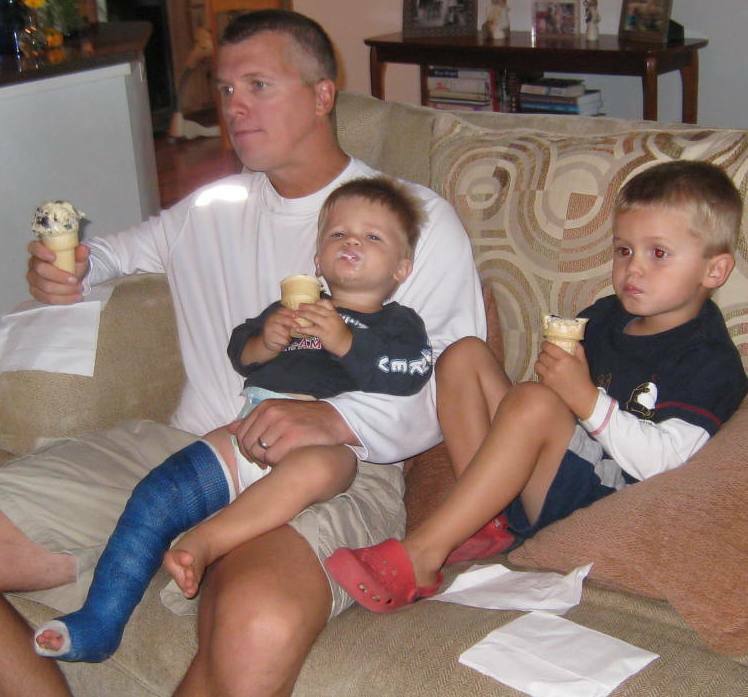 My nephew just broke his leg, and so did our little neighbor girl- it’s everywhere! I’m gonna put my boys in a bubble! I just found your blog, very cute, fun reading, thanks! That’s a cute picture:) Poor little Cooper looks like he’s over the hardest part.